Manchester United manager Jose Mourinho was at odds with senior figures at the club over the transfer of Jerome Boateng this summer. 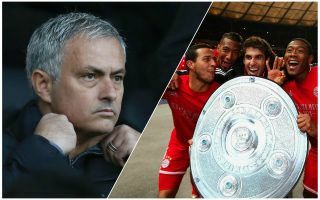 The Bayern Munich centre-back emerged as a target for the Red Devils late on in this transfer window, with Sky Sports reporting that he was open to a move and that Mourinho wanted him. However, CaughtOffside has since learned that the United board went over Mourinho’s head on the Boateng deal as the Germany international’s injury record was seen as making him too risky a purchase. It is true that Boateng hasn’t looked quite at peak fitness or form for a little while now, though he of course remains one of the most experienced and proven defensive players in Europe for the last few years. A serial winner with Bayern and the German national team, one wonders if the 29-year-old’s presence in the dressing room couldn’t have served United well this season. It seems Mourinho was clearly keen on the deal, but club sources have told CaughtOffside that this is one of many of the Portuguese’s personal targets that were seen as too short-termist by the club. How would you rate Man Utd's transfer window? Other notable targets this summer have included Chelsea winger Willian, 30, and Tottenham defender Toby Alderweireld, 29, which certainly does point towards a clear pattern. This certainly doesn’t seem to bode too well for Mourinho and his relationship with United as they kick off the new season tomorrow after their manager has cut a frustrated figure for so much of pre-season.